The Supreme Court directed the Malay Street area residents to tell the Urban Development Authority (UDA) over the weekend whether they would opt for a rental to find accommodation until they are provided apartments at their original place of residence or take full compensation and move out. Chief Justice Mohan Pieris instructed the UDA to post close to the area in question an official whom the residents could easily meet over the weekend and on Monday, when the fundamental rights petition filed by a group of residents in the Slave Island area, against acquisition of their lands, was taken up in Court on Tuesday.Addressing the litigants in open court Chief Justice Pieris advised them to make their choice known to the UDA official so that the UDA could make its own estimates before the next hearing fixed for Tuesday. Counsel Farman Cassim, however, told Court the UDA should give its valuation of the residents’ properties before they could decide on the option of getting full compensation. He said that the residents are reluctant to agree to the rentals to be paid to them as they are not sufficient.�The Chief Justice asked the UDA to be a little more generous in the valuation and be very humane in the matter. He further told the litigants the country needed projects like this to develop and the Court would do whatever possible to minimize the loss suffered by the residents. “We should get the maximum out of this project. We all want to lead good lives,” he noted. Chief Justice Pieris also asked the litigants not to be unduly worried, adding that the Court would give the maximum judicial protection to the residents.“I know what difficulties there would be if I am to move out of my present residence,” the Chief Justice said adding the project must go ahead for the betterment of the country. The Bench comprised Chief Justice Mohan Pieris PC with Justice P.A. Ratnayake and Priyasath Dep PC. Earlier, on February 27, a Bench comprising the Chief Justice and Justices P.A. Ratnayake PC and Priyasath Dep PC gave the green light for the project to proceed, vacating the order made on September 13, 2012 by a Bench comprising Jutices Shiranee Thilakawardena, K. Sripavan and Eva Wanasundara asking the UDA to maintain the status quo; without taking further steps to acquire seven and half acres of prime land in Slave Island for the development project till October 1, 2012. Subsequently the order was extended on several occasions. The Court noted that it would adopt, “a holistic approach, being mindful of the benefits to the community and the country at large and the overwhelming advantages as a whole,” and was unanimous of the view that the project should be permitted to proceed.�The Court also directed that the UDA could proceed with the project subject to the proposals of the Defence Ministry and the Urban Development Ministry made on February 15 setting out the enhanced rentals. The residents would be paid rental for two years to find accommodation until they are relocated in new apartments built by the developer in the same premises where they lived. �The order also noted that the proposed rentals have been further enhanced by the intervention of the Court. �The proposals noted that of the 517 residents identified for temporary relocation, 301 householders wanted to accept the rental scheme. 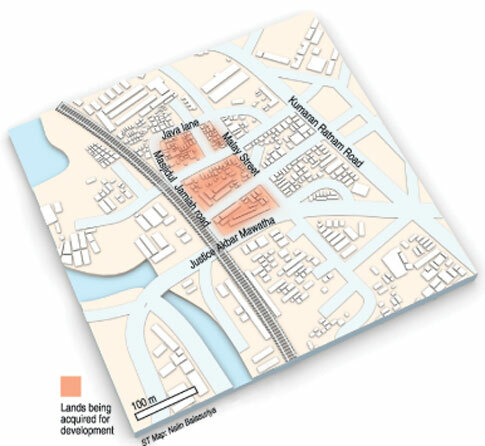 A group of residents living in the land located in Slave Island complained to the Court that their houses located in the area of Malay Street, Justice Akbar Mawatha, Java Place and Masjidul Jamiah Mawatha, would be demolished and acquired for the “Redevelopment of the Slave Island Area” project. �The petitioners stated the residents were notified on December 29, 2010 about the project and the UDA commenced work on it without consulting them. They complained their rights are violated by the acquisition as the Indian company would not better their lives by any means; they would lose their livelihood and the education of their children would be interrupted.�They said only the TATA Housing Development Company which would get the land free for development will be benefited by the project. The residents stated that the land would be given to the Company to construct an apartment complex for the area residents and the rest of the land would be given free to the company for its own business purposes. �They alleged that although the lands are acquired for a public purpose, in reality it is a business venture.�The petitioners sought a court declaration that the notice issued under Section 2 of the Land Acquisition Act, to acquire their lands is null and void. Counsel Sujeewa Senasinghe with Farman Cassim appeared for the petitioners.�Deputy Solicitor General Viraj Dayaratne with State Counsel Dr. Avanti Perera appeared for the Colombo Divisional Secretary and the Attorney General. Sanjeeva Jayawardena PC instructed by Sudath Perera Associates appeared for the UDA and its Chairman.Faizer Musthapha PC appeared for the Defence Secretary and the Urban Development Ministry. The hearing was fixed for March 12.